Me and Mr J have just sat and watched Thursday night's Jodie Marsh documentary on Making Babies. OK, so Jodie's documentaries are hardly Panorama, but they're refreshing and honest. 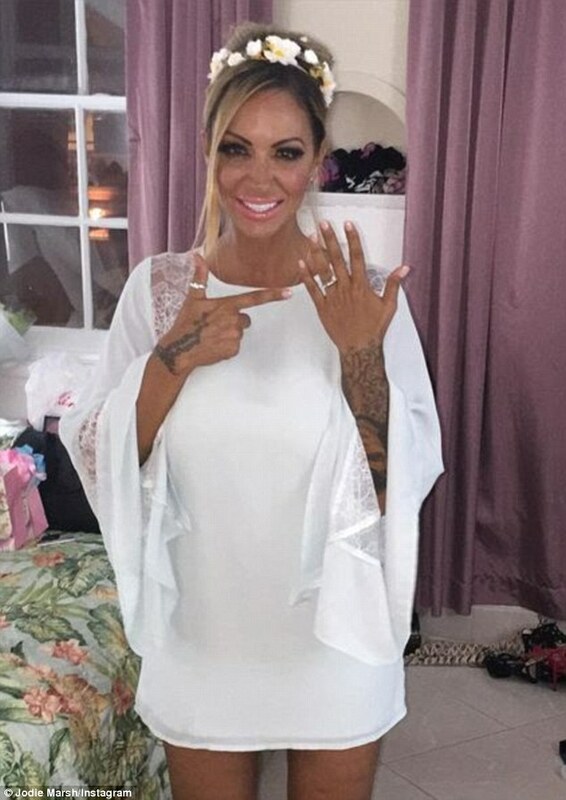 It was lovely to hear how Jodie Marsh who found fame whilst wearing just a couple of belts has now met the man of her dreams and settled down and wants to be a Mum one day. In the documentary Jodie herself underwent tests to see what her chances at the age of 35 are of conceiving. She was shocked at the results that her egg reserves are low. It was good to see Jodie bare herself in this way, rather than just speak to other couples. What was interesting was the differences between the UK and America in terms of egg and sperm donation. We have low supplies of egg and sperm donors in the UK and a lot of this is probably because only expenses in the UK can be paid...£30 for sperm donation and upto £750 for egg donation. In the US egg donors can expect between $4000-$10,000. Quite a difference. Jodie met a group of men all of whom agreed they'd donate their sperm to see if they could become donors. Out of the 6 who agreed to the trial, only one chap turned up and sadly his levels whilst good enough for regular insemination, weren't good enough to be frozen for donation. The documentary also featured a guy aka "Ed The Inseminator" who lives in Holland and acts as an sperm donor, but inseminates the mum to be in person, in the usual, ahem, fashion, as this yields better results. To date he's made 106 babies! An interesting concept, I'm not sure many fathers to be could wait in the next room while their other half is being inseminated! Something that shocked me was the option in America to choose from what is essentially a menu what type of child you'd like. The guy running the company Jodie visited compared using a surrogate to buying a handbag. He even had indentical twins himself, which were born 4 years apart due to freezing the eggs. You can choose height, hair colour, eye colour, intelligence etc. I personally think it's fine to use a surrogate if you cannot carry a child yourself due to medical reasons, or say for a gay couple who want a child of their own. However, Jodie spoke to one doctor who claims to have treated many A list couples, who simply don't want the "hassle" of being pregnant and the impact it would have on their income if they're in the public eye as a model or actree. He even suggested that some celebs even fake their own pregnancy whilst using a surrogate as apparently to admit to it would be a taboo. Hmmm, I wonder who has done this? Is having a baby not about pregnancy too? If you can't be bothered to carry a baby then can you really be that bothered about having a child? After all being a parent is for life, pregnancy is just 9 months. To me pregnancy isn't very glamorous, and yes we put on weight where we don't want it and risk getting the London underground map on our bellies in stretch marks, and lose the ability to bounce on a trampoline without a bit of wee coming out, but that's part of the journey. This pregnancy has without a doubt been the hardest for me. I had a suspected miscarriage at 4 weeks, terrible sickness from pretty much as soon as I found out, have since had a cervical stitch and am on twice daily progesterone...yet this is all part of being a Mum to me. And all this is after losing my little angel earlier this year, which of course causes a lot of emotion. But to see a beautiful, and hopefully healthy baby at end of this makes it all worth while. What do you think, would you use a surrogate? Have you used a sperm donor?